You are here: Home / Sweepstakes / FREE M&M’s Mini Mixer Culver’s! FREE M&M’s Mini Mixer Culver’s! 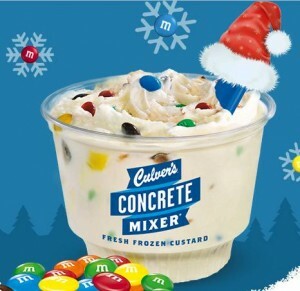 Head over here to send a FREE M&M’s Mini Concrete Mixer at Culver’s to up to 3 friends! Once you do, you will also be entered to win $1,000 cash! Open to legal residents of AZ, CO, FL, IL, IN, IA, KS, KY, MI, MN, MO, NE, ND, OH, SC, SD, TN, TX, UT, WI or WY. Ends December 13 at 5:00 P.M. CST.